The Menstuff® library lists pertinent books on starting, developing and maintaining a men's group. See How to start/maintain a men's group. 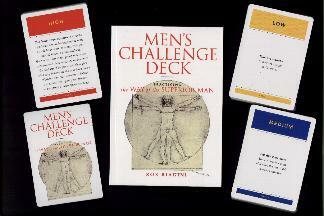 Biagini, Rob, Men's Challenge Deck: Practicing The Way of the Superior Man. "It is time to evolve beyond the macho jerk ideal, all spine and no heart. It is time to evolve beyond the sensitive and caring wimp ideal, all heart and no spine. Heart and spine must be united in a single man, and then gone beyond in the fullest expression of love and consciousness possible, which requires a deep relaxation into the infinite openness of this present moment. And this takes a new kind of guts. This is the Way of the Superior Man." David Deida. This is a deck of 88 cards to be used as a tool for men's personal and spiritual growth. Each card offers a challenge for a man to carry out - either alone or with others - that will help him clarify his deepest life purpose and live his fullest gifts in each moment. Great to be used in a men's group! Plexus, www.deida.com/deck 888..626.9662 ISBN 1-889762-17-2 Buy This Deck and Book! Clark, Perk, Thoughts on the Intentional Development of Men: Essential Elements for Men's Groups. Looks at different men's groups (pro-feminist, new-age, supportive, addiction, psychiatric hospital, mythopoetic and Sufi) covering the essential elements of each group. Plus a 7 page "Our men's group is stuck, what should we do." 25 pages, Nov. 92 , Psychotherapy & Organizational Development, 350 S Williams Blvd Ste 140 Tucson AZ 85711. Kauth, Bill, A Circle of Men: For Starting a New Group, For Existing Men's Groups. This step-by-step manual grows out of the author's two decades of experience with over 125 support groups. It will help the organizer or leader to start a group, find new members, solve group problems and great rituals and activities that promote honesty, self-disclosure and fun. This is a very complete, thorough and well organized publication and assists in getting through the fear so that deep work and support can happen. St. Martin's Press, 1992 ISBN 0-312-07247-3 New edition September 2015 Buy This Book! Liebman, Wayne, Tending the Fire: The Ritual Men`s Group. 64 pages working with mythology and the building of a strong group container for deep work. $7. Ally Press, 524 Orleans St., St. Paul, MN 55107. 800.1991 ISBN 0-915408-45-7 Buy This Book! Mark, Robert & Buddy Portugal Victories of the heart...The Inside Story of a Pioneer Men's Group. How Men Help Each Other Change Their Lives, is a story of The Men's Room program. Believing that isolation, competitiveness and anger keep many men from forming close, personal connections with other people, this positive and inspiring book encourages men to break through emotional barriers and create fruitful, intimate relationships. Element Books, 1996 ISBN 1852308001 Buy This Book! Owen-Towle, Tom, Brother-Spirit: Men joining together in the quest for intimacy and ultimacy. This book shows a remarkable sensitivity to men's religious quests. He does not assume that all men are on the same spiritual journey. Those journeys take many different forms, given the idiosyncrasies of our particular histories, not to mention our different life situations shaped by age, race, social class and sexual orientation. He holds up men's religious pilgrimages and illumines them. He takes us into the male-bonding circles to show us the problems and the enormous possibilities of men's ritual and support groups. He elucidates the common themes of the Brother-Spirit journey, themes which benefit the reader in private meditation as well as providing an exciting agenda for men's groups. In all of this there is the tone of balance" balance between the inner and the outer, the spiritual and the worldly. Bald Eagle Mountain Press, PO Box 4314, San Diego, CA 92164 uutom@aol.com ISBN 0-9630636-0-X Buy This Book! Taylor, George, Talking with Our Brothers: Creating and Sustaining a Dynamic Men's Group. The author has distilled and polished hours of processes into a concise and thoughtful format to both get a group started and to wake up one that's gone to sleep. Self-published, $9.50 + $2 tax & shipping, Men's Community Publishing Project, PO Box 296, Fairfax, CA 94930. 1995 ISBN 0-9644129-0-X Buy This Book! Written on a contraceptive vending machine: Worst chewing gum I have ever tasted. Someone added. Yeah but Oh what bubbles!